Shantanu and Nikhil's Modern Woman Will Make for A Moody and Brooding Bride. A duo whose collection always paints a beautiful picture with each outfit telling its own unique story. This time, with their latest collection titled – The Last Walk, showcased at Amazon India Fashion Week, 2016, the designer duo bring out a different kind of femininity, powerful and temperamental. 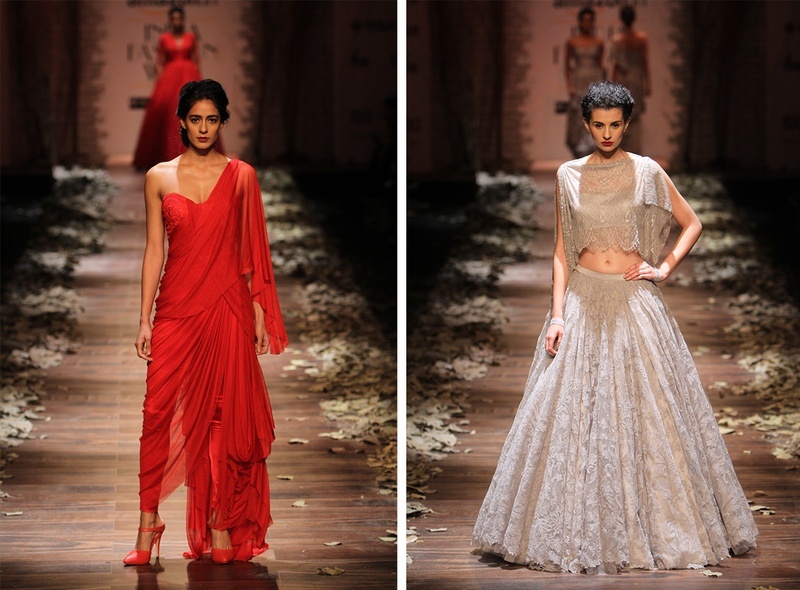 Shantanu and Nikhil rediscover their romance and love for drapes and silhouettes for the new-age bride. Inspired by the intensity of their 2004 collection, After Death, which gave them the belief to use fabrics and silhouettes that allowed them to speak an emotion of distress, luxury and vintage nostalgia through their designs; The Last Walk uses new textures of fabric and techniques such as tiers, layers and drapes in colors that are womanly, bold and endearing. Rediscovering their romance and love for drapes, with this collection they also bring a little something for the contemporary bride who is not afraid to take risks, be bold and stand out. “The Last Walk is based on the emotions of a strong woman who creates an existence of her own and is ready to embrace any turmoil that confronts her. She takes every bit of her journey as her last and is re-born each day—so in this collection, her transience is represented through calm hues like beige and grey, and fiery colours like red.” Source: Vogue. Symmetrically draped grey gown – so Greek Goddess like! Multiple drapes and full sleeves take us back in time to the Elizabethan era – so dreamy!